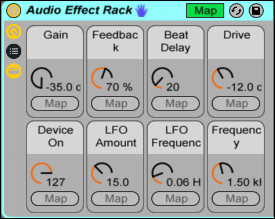 In this article, Dubspot’s Rory PQ shares his method of creating a Dub Delay Effect Rack in Ableton Live. 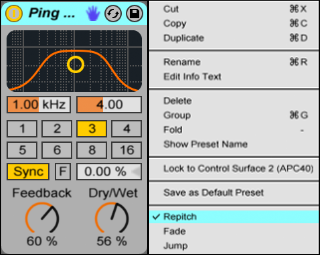 Included is a FREE Ableton Live Dub Delay Effect Rack download. 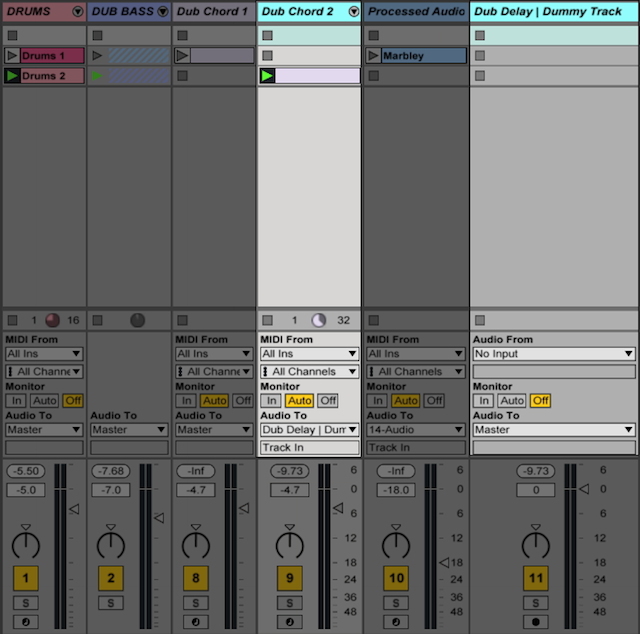 Interested in taking Ableton Live classes at Dubspot? Learn more about our course offerings and Enroll Today! Using audio delay effects in the studio or on the road in your live performances is a tried and tested technique used in nearly every genre of music by musicians worldwide. This time-based effect is among the most effective and versatile mixing techniques used to enhance a static sound or mix, create unique sonic textures, achieve depth and space, and build energy or tension. Among the many types of delay styles is an innovative method commonly referred to as ‘dub delay’ or ‘feedback delay’. 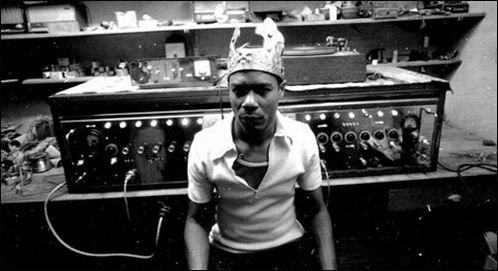 This self-styled delay effect emerged in Jamaica during the late 1960’s by dub music pioneers, such as King Tubby, Lee “Scratch” Perry, Prince Jammy, and later Scientist and Mad Professor. Born as an offshoot of reggae, dub was an early remix concept developed by mixing engineers to create alternate versions of existing recordings. Discovering innovative ways to use outdated recording and mixing equipment, these mixing engineers took on the lead role in shaping and manipulating sounds. Establishing themselves as artist in their own right, the mixing engineer would strip down a recording leaving the drum and bass parts referred to as ‘riddim’. They would then dub over the riddim with vocal and instrumental snippets to make a new composition. Other techniques that made dub so unique was the inventive use of equipment in ways they were not designed for to create spatial effects, such as delay and reverb. Engineers often modified existing equipment or invented new units to process sound with extensive use of echo textures, reverb bursts and washouts, panoramic effects, and feedback delays. What is a Dub Style Delay? Dub style delays commonly have long feedback delay tails and are often created from a complex chain of audio effects to make them sound unique and more advanced than a simple stereo delay. They essentially have a dual purpose of being an effect and an instrument designed to create evolving sound textures used in a variety of ways. Manipulating the sound by controlling or automating different device parameters throughout the effects chain gives the artist creative freedom to add movement and evolve their sound. What’s nice is this simple but effective technique is suitable for any genre of music. 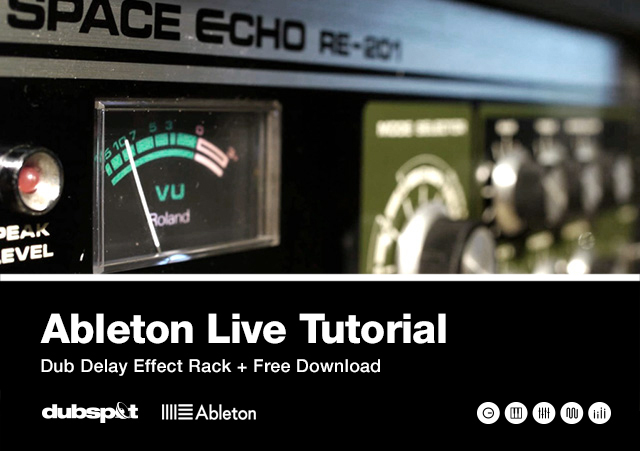 Now that we explored some history of the dub delay and have a good idea of what it sounds like, lets continue by developing our own dub delay effect rack in Ableton Live. After we build our own custom effect rack shown below, we can begin to explore some common ways to apply the effect in the studio or in a live performance. First, in case you’re wondering, ‘why build an effect rack when there are so many great third-party plugins?’ Good question, you could certainly use a third-party plugin. However, creating our own custom rack gives us the freedom to design something unique that even the most expensive VST could not possibly do. Especially with the endless possibilities of using Live’s rack features and chains to parallel process multiple layers and channels separately with effects. Plus it’s another way to put your creative stamp on your work. Lets jump right in and start creating a dub style effect rack in Ableton Live that can be either triggered with a dummy clip in your live performances or inserted in a return track. We will keep things fairly simple as a starting point to allow creative freedom so you can further develop it with your own flavor of devices. Create an effect rack by grouping the Ping Pong device. Right-click or CTRL + Click on the Ping Pong title and choose ‘Group’. Alternatively you can click CTRL + G (PC) CMD + G (Mac). Lets add a few other devices for some additional flavor and movement. Before the Ping Pong drop a Utility device to control levels and a Saturator to add some grit and warmth to the signal before it delays. 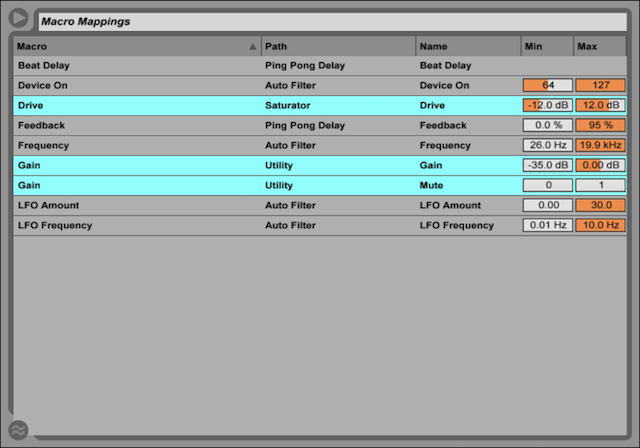 After the Ping Pong, drop an Auto Filter for creating filter sweeps followed by Compressor to help control dynamics. Later, adjust the Compressors ‘Threshold’ to control and balance the signal and keep those delays in check. Now that we have a foundation for our rack, we can go in and setup our devices to taste and begin Macro mapping key parameters to control our delay sound. Lets start with Utility, and move right across the effect chain. The Utility is used to fade the signal out and mute it when not activated. Right-click the ‘Mute’ button and choose ‘Map to Macro 1’ from the menu. Using the right-click method again, right-click ‘Gain’ and map it to Macro 1 as well. Moving over to the Saturator, map the ‘Drive’ parameter to Macro 4 and adjust the input signal to around 4.00 dB. To be safe, decrease the ‘Output’ level to -3 dB. Looking at the Ping Pong delay, map ‘Feedback’ to Macro 2 and adjust the ‘Amount’ to 70%. 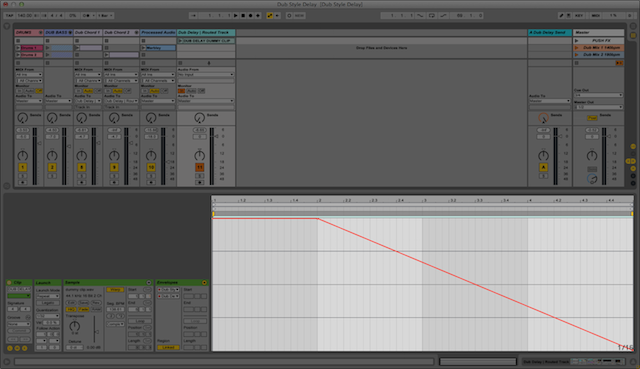 Next, map the ‘Beat Division’ to Macro 3 and adjust the delay time to taste. Note, that the delay times are in ‘Sync’ mode. This works best when using the rack in a live performance and triggering the effect with a dummy clip. You can also use ‘Time’ mode, which is a lot of fun automating to achieve some interesting results. Lastly, increase the ‘Beat Offset’ percentage to around 1.50 % to add some swing to the delays. Lets setup the Auto Filter next. Set the ‘Filter Type’ to ‘Bandpass’ to clean up the sound and thin things out so the delay cuts through the mix better. Adjust the ‘Filter Frequency’ to around 1.50 kHz and increase the ‘Q’ slightly to around 1.00. Now, increase the ‘Envelope Amount’ slightly to modulate the filter frequency. Next, looking over at the LFO controls increase the ‘Amount’ to taste for some additional movement. I found a nice balance around 15.0 to keep things subtle at first. Also increase the ‘Rate’ slightly to around 0.06 Hz for some subtle movement. You could also use ‘Sync’ mode to sync the rate to the tempo if you like. Using ‘Hz’ mode can often produce some interesting results as well. Lastly, turn Phase down to 0.00. Sweet, our Auto Filter is setup and ready to be Macro mapped. Right-click the ‘Device Activator’ and choose ‘Map to Macro 5’. Using the right-click method again, map the LFO ‘Amount’ to Macro 6, LFO ‘Rate’ to Macro 7, and the ‘Filter Frequency’ to Macro 8. Your dub style delay rack should look similar to one pictured below. The setup is nearly finished. 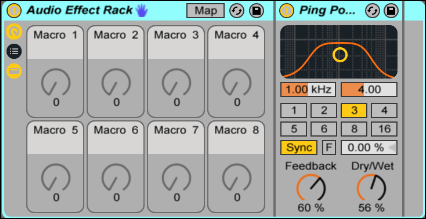 Lets dial in the rack some more by opening the ‘Mapping Browser’ and adjusting some parameter ranges to keep things from going too crazy when controlling the Macros. Above the Macro pots click the ‘Map Mode’ switch to open the ‘Mapping Browser’. At this point our dub style delay rack is ready if we wanted to simply insert it onto a return track. Lets take the process even further so we can use the rack in a live performance and trigger the effect with a dummy clip. Lets start by selecting the rack and clinking CMD + G to group the rack into another effect rack. If we placed the rack on an audio track as is, the original signal would be drowned out by delay. Lets create a second chain layer to allow the original signal to pass through unaffected. This way we can trigger our delay and have it run in parallel with the original signal. Right-click in the ‘Chain List’ area below the current chain and select ‘Create Chain’ from the menu. This will create a second chain we will call ‘Dry’. Above the chain list, click the ‘Chain’ button to open the ‘Chain Select Editor’. Here we will set up a dry/wet control for both signal paths. Start by click and dragging the little blue bars to define a range of values for both chains. Then click and drag the top portion of the first blue bar to create a fade like in the image below. Note that there is gap at ‘0’ for the first chain to stop the signal from passing through when not in use. Almost there! Lets create some additional Macro mappings to tie this entire rack together before putting it to use. While still in the ‘Chain Select Editor’, right-click the orange ‘Chain Selector’ bar at the top and assign it to Macro 5. 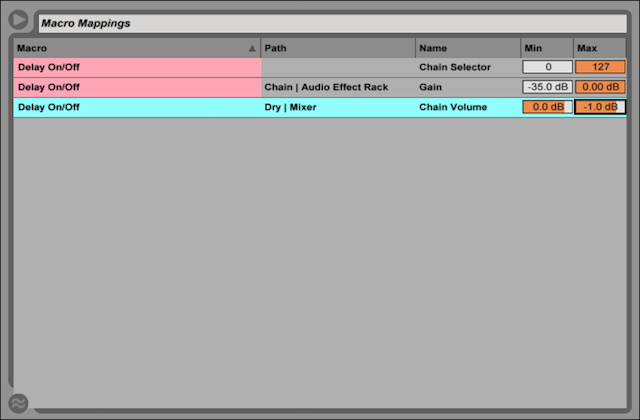 Move over to the ‘Dry’ chain and map the ‘Chain Volume’ to Macro 5 as well. This Macro will be our On/Off switch for the entire rack. Lets name it ‘Delay On/Off’ and give it a pretty color. Next, move back over to the dub delay chain to see the Macro controls again. Right-click on the first Macro labeled ‘Gain’ and choose ‘Map to Delay On/Off’ from the menu. You could also Macro map the other controls to the remaining empty Macros as well. Finally, open the ‘Mapping Browser’ one last time and adjust some parameter ranges again. Back to the first set of Macro controls, click the ‘Map Mode’ switch to open the ‘Mapping Browser’. How Do I Use the Dub Style Delay Rack? Using Ableton Live we will continue on our dub delay journey and explore two common methods for applying your new dub style delay rack in the studio and in your live performances. The first method explores using dummy clips to trigger effects in a live performance, while the second method demonstrates how to use sends to create a feedback loop, and automation to keep things interesting. The first method is suitable for a live performance because it involves working in Session View and triggering the effect with a dummy clip. What is a dummy clip you may ask? Well, a dummy clip is an empty audio or midi clip. Its not intended to play any audio. Its purpose is to modulate sounds that are being sent though it by triggering automation contained within the clip. Essentially, it is a clip with automation and not any audio. Why not just insert the effect instead of using dummy clips? Good question, it saves on CPU because you can send multiple tracks to one effect instead of having multiple instances of the same rack. It also allows the original signal to keep playing without any interruptions, as well as allows the signal to pass through in parallel unaffected. Lets kick things off and set up an audio track for our dummy clip and then route an audio signal into that audio track for some dub delay fun. First, click CTRL + T (PC) or CMD + T (Mac) to create an audio track in Session View. Rename it to something familiar. I’ll choose ‘Dub Delay | Dummy Track’. Next, open the ‘In/Out Section’ by clicking ‘I-O’ button to the far right of Live’s interface and choose a track you wish to run through the dub delay. Often in a live performance this would be whatever track your using to play your tunes. For this demonstration we will send audio from the ‘Dub Chord 2’ track. In the ‘I/Out Section’ of this track choose ‘Dub Delay | Dummy Track’ from the menu just below ‘Audio To’. 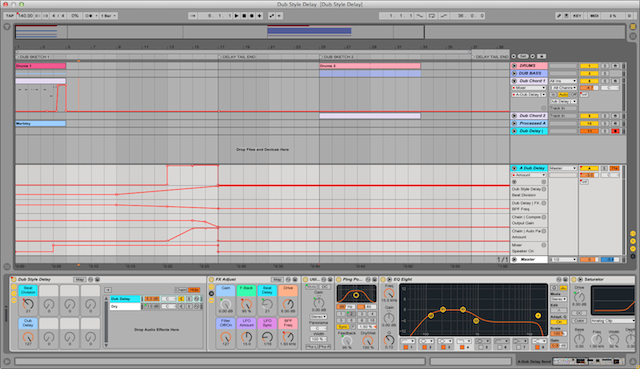 Moving along, arm the ‘Dub Delay | Dummy Track’ by clicking the ‘Arm Session Recording’ button next to the level fader. Choose an empty clip slot in the same track and click the ‘Record’ button to begin recording an empty clip into the clip slot for a length of 4 bars. Set the tracks ‘Monitor’ to ‘In’ and drop in your newly created dub style delay rack. Click on the dummy clip you just created to open ‘Clip View’. In the bottom left of the Live’s interface click the ‘E’ button to open the ‘Envelopes Box’. 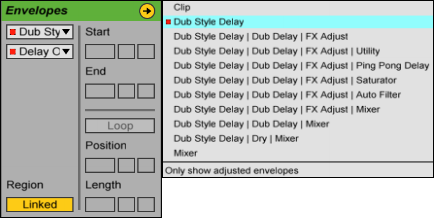 Within the ‘Envelopes Box’ click the top ‘Device Chooser’ drop-down menu and select the dub style delay rack. In the ‘Control Chooser’ menu below select ‘Delay On/Off’. In the ‘Launch Box’ to the left set the ‘Launch Mode’ to ‘Repeat’ and ‘Quantization’ to 1/16. This allows you to click and hold the dummy clips launch button and have the delay loop continuously at 16th note intervals until you release the button. You can set the quantization to any beat division you like as well. Working in the ‘Sample Editor’ to the right, draw some automation like in the image below. The automation triggers the ‘Delay On/Off’ Macro. When launching the dummy clip, the Macro will start at 100% wet and gradually fade out until it completely turns the rack off. Well done, if everything went smoothly you should be ready to pump up the crowd and add some dub style delay sweetness to your live performances. The second method in our exploration of dub style delays is suitable for the studio because we will be working in Arrangement View to draw in automation to control multiple parameters. The setup is fairly easy and involves dropping in the dub style delay rack onto a return track, and then looping the delay signal back into itself to create a feedback loop. This is a great technique for creating those long atmospheric delays that evolve and transform, psychedelic like. Like the previous method, you can send multiple audio signals to a single return track to apply an effect. What’s nice about this method is that you can process any sound without altering the original signal. The audio signal being sent to the return track runs in parallel with the processed signal and will play unaffected. Think of it as two layers of sound, dry and wet. Lets jump in and set up our dub style delay feedback loop. From the ‘File’ menu click ‘Create’ and choose ‘Insert Return Track’. Next, drop the dub style delay rack onto the return track. Alternatively, you can click the ‘R’ to the right of Live’s interface to show existing return tracks and ‘S’ to show track ‘Send’ controls. Choose a track you wish to send through the return track with the dub style delay rack. For this demonstration, I’ll choose the’ Dub Chord 1’ track. On the same track, locate the ‘Send’ control that correlates with the same return track, and turn it up to 100%. 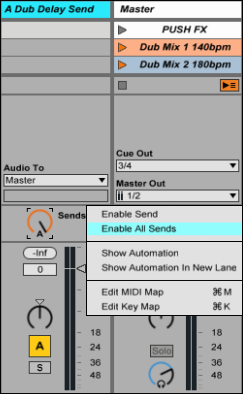 Back over to the return track, right-click on its own ‘Send’ control and choose ‘Enable Send’. Adjusting this ‘Send’ is how we will apply the delay feedback. Gradually increasing the ‘Send’ on the return channel will send the returned signal from the delay rack back to its own input. As you turn up the ‘Send’, listen for an increase in the feedback level and be EXTREMELY CAUTIOUS because the feedback can escalate and potentially damage your speakers and your hearing. Slapping a Limiter to the end of the device chain is recommended. On the Master channel toggle ‘Post’ to ‘Pre’ so we can adjust the levels before it enters the return track. Nice, everything should be setup now and ready to test drive. To get things grooving, first record some audio into Arrangement View. Next, click ‘Tab’ to switch over to Arrangement View. Playback what you just recorded and start experimenting with the various Macro controls on the dub style delay rack. Once you discover something that works, you can draw in automation, or even better, map the controls to a MIDI controller and record in automation while you jam!